Openreach, Britain’s leading digital network business, today launched the UK’s first high-bandwidth managed service that allows Communications Providers (CPs) to operate private data connections using ‘virtual dark fibre’[i]. Once connected, customers will be able to significantly scale up capacity by adding channels - each able to support 100Gbps – with a maximum bandwidth of more than 3 Terabits – enough to download the entire human genome in less than a second. This virtual dark fibre service (labelled Optical Spectrum Access Filter Connect or ‘OSA FC’) gives CPs all the key benefits of dark fibre – like the freedom to control and increase bandwidth usage at no extra cost – without compromising on service and maintenance levels. It works by enabling CPs to operate their own network electronics on top of a managed connection which Openreach can monitor 24/7 and provide rapid response and repair times over. 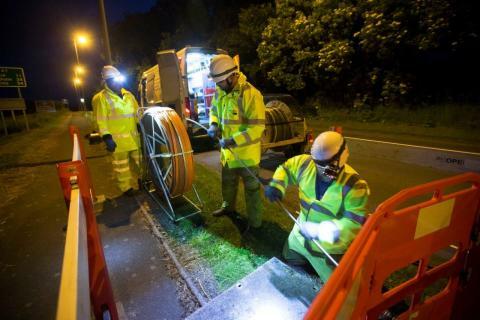 Whilst a fault on dark fibre could take days to discover and repair, Openreach will guarantee an industry-leading five hour repair time on OSA Filter Connect services. Darren Wallington, Openreach’s General Manager for High Bandwidth and Passive Products, said: “We’ve re-engineered our high-bandwidth optical services to give our wholesale customers far greater flexibility at a fantastic price. OSA Filter Connect allows providers to grow their needs affordably, at their own pace and using their choice of innovative equipment. The new service is an extension of Openreach’s OSA portfolio[ii] and is built over a new or existing Optical Spectrum Access service – a dedicated optical fibre link used to move very large amounts of data between two locations. The Filter Connect feature uses spare capacity on an optical filter – a piece of kit that splits out different wavelengths of light over the fibre – and provides additional channels so that CPs can connect their own equipment to manage and transmit data free of charge on top of the existing Openreach managed service. Scalability - Openreach provides the Optical bearer and includes 10Gbps of capacity by lighting the first wavelength. Subsequently, customers are able to access the remaining capacity and manage it themselves. Pricing – customers can decouple the cost of connectivity from bandwidth scaling and Openreach assumes responsibility for non-domestic rates. Pricing details can be found here. Flexibility - Upgrade and certification options available so customers can convert their existing installed OSA FSP3000 base to enable the addition of their own equipment through the optical filters. Configuration options are available via point-to-point or hub & spoke designs. Assurance – Established Service Level Agreements; 35 working-day delivery lead time and five hour fix time. Buying additional Openreach managed wavelengths still remains an option for customers who prefer not to manage their own optical electronics. Space – Design premise based on minimal space usage. Ability to support fast evolving technology - supports phase synchronisation for 5G technology. This provides CPs with a 10GB managed service with spare filter ports that they can use to scale to higher bandwidth by themselves with no additional costs from Openreach. We will continue to offer additional Managed Wavelengths for those CP’s who prefer a managed service at very competitive price points. At the same time the 5 year term variant will now in effect make be a 3 year term product, as we’ve set the early termination charges for Year 4 and 5 to zero. [i]Data is transported over optical fibre networks by passing light through glass cables thinner than a human hair. If no data is being transported, there is no light and the fibre is ‘dark’. ‘Dark Fibre’ is basically an optical fibre that isn’t in use. [ii]OSA products provide CPs with secure, permanently connected, high speed data circuits that use Dense Wavelength Division Multiplexing (DWDM) technology on dedicated fibre. DWDM allows multiple data signals to be transmitted simultaneously over the same optical fibres – used for a range of premium services from cloud applications and next generation data centres to high speed file transfer and business continuity solutions, such as information storage and retrieval.